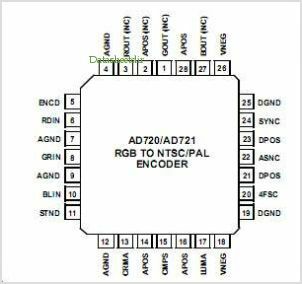 The AD720 and AD721 RGB to NTSC PAL Encoders convert red, green and blue color component signals into their corre- sponding luminance (baseband amplitude) and chrominance (subcarrier amplitude and phase) signals in accordance with either NTSC or PAL standards. These two outputs are also combined to provide a composite Video output. All three out- puts are available separately at voltages of twice the standard signal levels as required for driving 75 reverse terminated cables. The AD721 also features a bypass mode, in which the RGB inputs may bypass the encoder section of the IC via three gain-of-two Amplifiers suitable for driving 75 reverse termi- nated cables. The AD720 and AD721 provide a complete, fully calibrated function, requiring only termination resistors, bypass capacitors, a Clock input at four times the subcarrier frequency, and a com- posite sync pulse. There are two control inputs: one input selects the TV standard (NTSC/PAL) and the other (ENCD) powers down most sections of the chip when the encoding func- tion is not in use AD720 or activates the triple bypass Buffer to drive the RGB signals when RGB encoding is not required AD721 . All logical inputs are CMOS compatible. The chip operates from 5 V supplies. By Analog Devices, Inc. This is one package pinout of AD721,If you need more pinouts please download AD721's pdf datasheet. 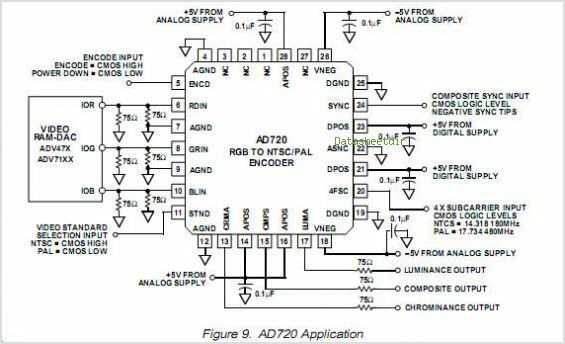 This is one application circuit of AD721,If you need more circuits,please download AD721's pdf datasheet.